West Ham and Chelsea have been fined £40,000 and £50,000 respectively by the Football Association after both clubs admitted failing to control players. The punishment follows the Hammers' 2-1 win over their London rivals at Upton Park on 24 October. 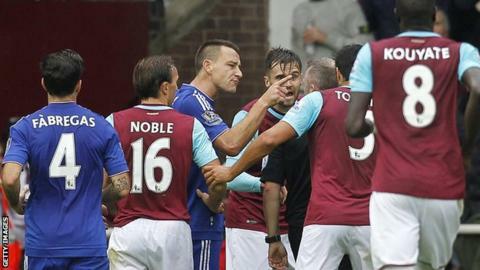 Chelsea had five players booked, and midfielder Nemanja Matic and manager Jose Mourinho were sent off. West Ham's players surrounded referee Jonathan Moss after Matic's challenge on Diafra Sakho in the 44th minute. "The charge was for failing to ensure players conducted themselves in an orderly fashion," read an FA statement. "Both clubs were also severely warned as to their future conduct." Chelsea players also surrounded the official after Matic, who had been shown a yellow card earlier on, was given a second booking by Moss and dismissed. Mourinho was sent to the stands for the second half after going to speak to Moss in the referee's room. He received a one-game stadium ban and £40,000 fine.